Once again, I found myself back again at this gaming café located at The Cathay. This time I was there with LuttiSparrow & Co. With 3 people in our party we got a room that is slightly bigger than the last time I was there. If you don’t know already, St Games is a gaming café that offers you the experience of console gaming for Playstation 3, Xbox 360 (Kinect) and Nintendo Wii; a perfect solution for those who want to try or cannot afford the space and game consoles. It has another outlet at Bugis +. 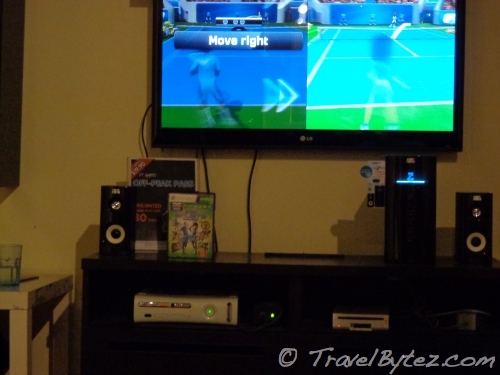 This time the games were similar to the last time, Dance Central, Sports and Fifa Manager (for Co.) in the Xbox 360 (Kinect) room. There is only so much you can play within 3 hours and with 3 persons, but it was good fun (and exercise). As the time neared the late afternoon, more people started streaming in. Soon the (very loud) laughter (especially from the room next door) could be heard from both the young and the young-at-heart. When we were there, LuttiSparrow noticed drum and guitar equipment and wanted to play it. We were informed that it was another type of room that we had to book if we wanted to play those. So that’s another excuse, I mean reason, to go back again!